Stephen of Evans Wealth Planning is thrilled to bring this educational opportunity to the people of Springfield in a fun and exciting atmosphere. 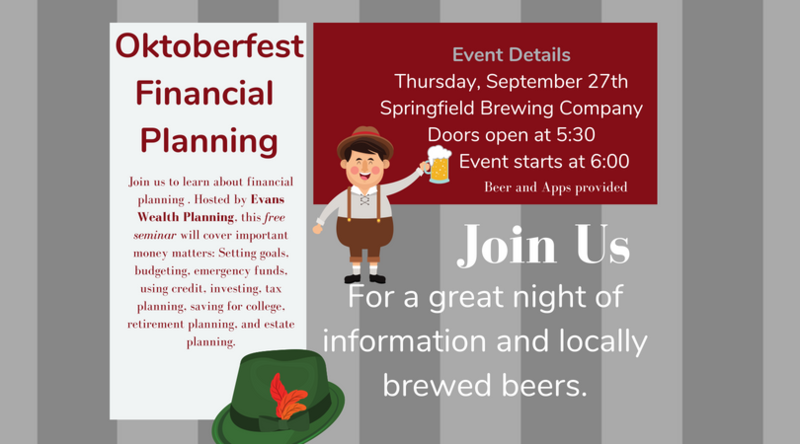 Join us at Springfield Brewing Company to enjoy an Oktoberfest themed informational seminar. There will be 1 free drink ticket per registered adult for the event. Register early to secure your spot. Seats are limited. Stephen will spend some time going over a variety of topics to help you and your financial future. There is no cost and no financial obligation. This is strictly education but you must register. We will have a Q&A session at the end of the presentation.